The Players Packet has now been released! Inside you’ll be able to find out the schedule, total points you can get and how to get them, as well as the various awards we’ll be handing out over the weekend! You can download it right here! In addition, for your viewing pleasure, here’s the Painting Rubric that your army will be judged on for the GT. You can see where you will be able to get maximum points! If you have any questions orif you’re interested in signing up send an email to thewickedgt@gmail.com. Plenty more details to come and be on the lookout for the official Players packet! For now, registration is officially open so make sure to sign up and get registered. This year promises to be the biggest and best Wicked GT yet! If you’ve been before then you know all the fun that we have throughout the weekend and if this is your first time then prepare to be amazed. There are plenty of giveaways, handouts, prizes, raffles, and more and we always make sure that each and every single participant never walks away empty handed! If you’re interested in signing up send an email to thewickedgt@gmail.com. The 2018 Wicked GT has come and gone and fun was had by all!! We laughed, we cried, and we drank to victory… and even defeat! 2018 was definitely one for the books and we are looking forward to the rest of the GT circuit this upcoming summer and into fall! Thank you for helping to kick it off in a huge way! Make sure to check out the Results Page! 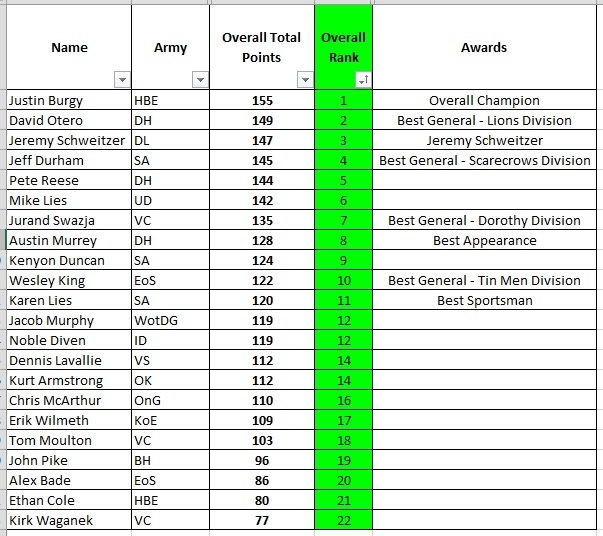 And here’s a link to the Final Standings! Well…. here we are! Just 1 week away from the 4th annual Wicked GT!! It’s been a long wait and it’s just about here! Lists have been submitted and Round 1 pairings are coming up! We still have open spots so if you know of anybody that’s on the fence with signing up then go ahead and convince them to sign up because the Wicked GT promises to be the best it’s ever been! We want to break attendance records so you have 1 week to get people here and make this year the best year yet!! And now for some really exciting news!! For those of you that are interested, we will be having a LIVE LIST REVIEW beginning at 7:00PM CST streaming at Dark Wizard Gaming!! We’ll be going over the 1st round pairings, making some bold predictions, and have general tabletop banter going on! You don’t want to miss out on it so make sure that you’re tuned in and on time!! It’s going to be awesome! Registration continues for the 4th Annual Wicked GT 2018! If you’re interested in signing up and being apart of one of the best GTs in the Central USA then make sure that you make it out! Currently we have 24 generals and there’s bound to be several more sign up. Let’s continue on with the 2018 GT Circuit! The road continues right through the Wicked GT! April 9th: Just 3 days away at the time of this post!! Please make sure to let me know if you need to back out and I can offer you a full refund! After this date, refunds will be unavailable. Please understand that after this date the majority of the funds for the Wicked GT have already been spent so I will not be able to issue refunds. Thanks for your understanding on this.